What is the Risk of Pancreatic Cancer in Patients with Low-Risk IPMNs? 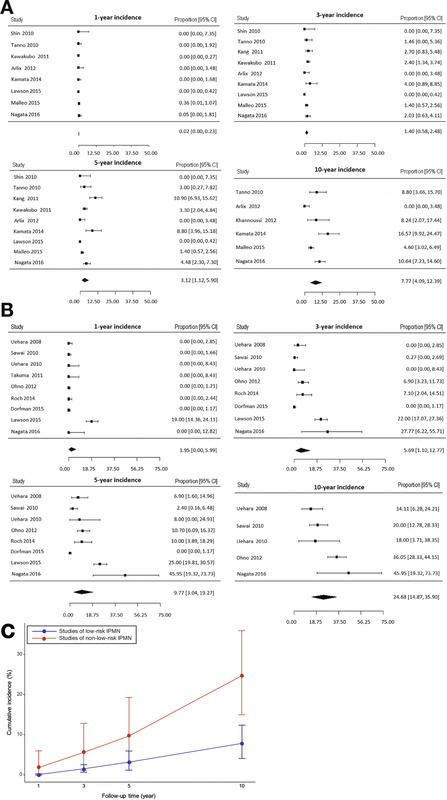 Low-risk intraductal papillary mucinous neoplasms have an almost 8% chance of progressing to pancreatic cancer within 10 years, whereas higher-risk IPMNs have almost 25% chance, reports a systematic review and meta-analysis in the October issue of Clinical Gastroenterology and Hepatology. Continued long-term surveillance is therefore important for patients with low-risk, as well as higher-risk, IPMNs. IPMNs have been detected more frequently with the widespread use of cross-sectional abdominal imaging. Little is known about their prevalence, because many IPMNs are asymptomatic, but series studies have reported prevalence values ranging from 2.6% to 13.5%. Meta-analysis estimates of cumulative incidence of pancreatic cancer over different follow-up periods. Error bars=95% CI. Although there is general agreement that IPMNs with enhanced solid components or main pancreatic duct diameter ≥10 mm should be surgically resected, guidelines are not clear about management of smaller IPMNs. American Gastroenterological Association guidelines propose stopping surveillance for pancreatic cysts smaller than 3 cm without a solid component or a dilated pancreatic duct if there has been no significant change for 5 years, based on low-quality evidence. However, the best management strategies for low-risk IPMN lesions (observation vs surgery), and the time of observation, are unclear. Sang Hyun Choi et al sought to determine the cumulative incidence of pancreatic cancer in patients with unresected IPMNs, especially low-risk IPMNs, based on data from multiple longitudinal studies. They performed a systematic search of medical publication databases for studies reporting the cumulative incidence of pancreatic cancer in patients with unresected IPMNs or studies that provided data in sufficient detail to calculate cumulative incidence values. Choi et al defined low-risk IPMNs as those with no main pancreatic duct dilatation (diameter smaller than 5 mm when specified, or a claim of no duct involvement according to the original study description) plus a lack of mural nodules. IPMNs that did not meet these criteria were categorized as non–low risk (heterogeneous among the studies). In their meta-analysis of 10 studies comprising 2411 patients with low-risk IPMNs, the cumulative incidence values for pancreatic cancer were 0.02% at 1 year, 1.40% at 3 years, 3.12% at 5 years, and 7.77% at 10 years. These values were much higher in their analysis of 9 studies comprising 835 patients with higher-risk IPMNs. For these patients, the cumulative incidence values for pancreatic cancer were 1.95% at 1 year, 5.69% at 3 years, 9.77% at 5 years, and 24.68% at 10 years. The pooled cumulative incidence increased linearly with followup (see figure). In the low-risk and non–low-risk groups of studies, no significant publication bias was noted, except for the 1-year time point in the studies of low-risk IPMN. Choi et al conclude that low-risk and higher-risk IPMNs pose higher risks for pancreatic cancer with time. Although patients with low-risk IPMNs have an lower incidence of pancreatic cancer and a low absolute incidence of pancreatic cancer at early time points, their cumulative incidence of pancreatic cancer reaches 7.77% at the 10-year time point. These cumulative incidence values correspond to annual incidence rates of 0.65% to 0.8%/year. Choi et al conclude that it is important to continuously follow patients with low-risk IPMNs, and avoid becoming complacent about lesion stability after the early follow-up period.